CD Review: Hanson Brothers, "Sudden Death"
Hey kid! Ya like da Ramones? Ya like da 'ockey? Ya like dat movie there thing, Slapshot? You do! Good. 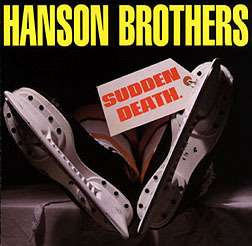 Do you like Sudden Death, the Hanson Brothers' new record? No, not the guys from the movie, the band of hockey-loving punks who spread the gospel of the greatest game on Earth. You don't have it yet? That's a five-minute major for being a moron. I'll tell you about it while you grovel and pout in the penalty box. Heavily influenced by the Ramones, the Hansons have put out a fun album filled with tough, fun hockey songs. They kick it off with "Hockey Song," a punkified tribute to Stompin' Tom Conners: "The good old hockey game is the best game you can name and the best game you can name is the good old hockey game." You know it! Other notables are the metal crunching sounds of "Third Man In" and the inspirational 50's/Ramones fusion of "Stick Boy." Sudden Death skates down the ice with a great energy, like Paul Coffey winding up behind his own net to start that end-to-end rush. The guitars and vocals hit as hard as Gino Odjick and overall the album is fun as Eddie Shack. That's it: it's good, it's loud and it's fun. Go get it. Now! Or we'll send Tiger Williams after you! Hell Yes! Let Tiger In!